2003 Season "The Fishing Line"
Ice Fishing : Our 2003 season premier is an ice fishing trip we took to Kenosha Lake in CT with Bill Evans, Meteorologist for WABC TV Channel 7 Eyewitness morning news and John Cumisky of the Valley Angler in Danbury, CT. I had always wanted to ice fish and do a show on the subject, but we haven't had real good "hard water" for several years! On this trip we took the week before Valentine's Day this past February of 2003, we hit this smaller lake near Candlewood Lake outside Danbury with John, Bill and the member of the Jig N' Pig Ice Fishing Club of Danbury. On this show we go over some of the ice fishing Do's and Don't with John Cumisky and we also go over what it takes to make ice, the weather conditions associated with making ice and what is "safe" ice or not with Bill Evans of Channel 7/WABC. We'll also have exclusive web clips of Bill Evans' detailed explanation of El Nino and El Nina coming shortly later next week, not seen in the show itself...and since so many of you have asked for it in e mails and on our message boards, we've added out take bloopers at the end of every show for 2003. This was a good old-fashioned fun show with a couple of great guys and I have found one of my newest and most favorite ways to fish...Ice Fishing! You can also speak with bill about the weather as well on his at Speak with Bill Evans. Watch a trailer for this episode by clicking the projector icon. Moriches Bay Clam Bellying Stripers : Our second show of the 2003 season is a Clam Bellying show we did in Moriches Inlet with special guest and friend, Jake Hartwick. The difference with this clam belly episode is the way we clam bellied. We fished right smack in the middle of Moriches Inlet with a hard running tide of 5 knots or so and keeping the clam bellies down was of the utmost importance. We used a mesh bag with a 5-pound sash weight. I had actually gone with lighter tackle than I should have, but we made out just fine with bass to 20 pounds. In this show we debut some new and exciting features to our program with new Captain's Corner & Tackle Talk segments covering in detail the tackle and Rigging we used. You'll also see for yourself how sharp the hooks we use are...as in one instance it penetrates the bone and part of the gill plate of the striper!...with no harm done either! As always we show in full screen detail the Rigs we used with success, mapped out so you at home know exactly how to do the same rig and of course our Boating or Fishing Tip of the Week is included. Raritan Bay Spring Flounder : Our third episode of the 2003 season is a Spring Flounder trip we did in Raritan Bay, NJ. Raritan Bay has been the hot spot for the hot flounder bite the last few years and this trip was no exception as we had some great flattie action using sandworms, bloodworms and clam strips. On this show we bailed the flounder showing you the exact tackle we used, Maps & Areas we fished, along with our full screen detail Rigs we used with success, and we tell and show the importance of chumming for flounder, which by the way was interrupted several times on camera by catches of jumbo flounder that couldn't resist out bait and chum. Using super light tackle, we caught flounder to 17 inches! As always we show in our Boating Tip of the Week is included where you can save energy, electricity and cash all at the same time. Watch a trailer for this episode by clicking the projector icon. Orient Point Night Stripers : Our fourth episode of the 2003 season is a night striped bass trip we did out of Orient Point on the tip of Long Island's North Fork. Orient Point is the home of 50 pounders on a regular basis both in fall when we filmed this show, but more so in the spring during late May and June! On this episode we had a terrific trip in less them primo conditions as we had strong winds and a wind against tide situation. We show the exact tackle and Rigs we used along with our full screen detail. Using stout tackle with the secret being longer than normal leaders to the eels. We used 8-foot leaders (some may use 10 to 12-foot leaders) by doing this we caught bass over 25 pounds! As always we give you our weekly Boating Tip of the Week included. Watch a trailer for this episode by clicking the projector icon..
Montauk Point Surf Fishing/Part 1 : Our fifth episode of the 2003 season is a trip to Montauk to do what may be favorite way to fish...the surf with Pencil Poppers. My guests for this two part series were Vinny Sobral, owner of Freddie's Bait and Tackle in Montauk and Willie Young, president of the Montauk Surfcasters Association. We used pencil poppers in this show for exciting surface explosions as stripers to 20 pounds crushed our offerings on film for all to see. We went over and covered the tidal importance of the Montauk area with Vinny and Willie and included some awesome aerial views of the Montauk Beaches from the south side all the way around the light to Shagwong and gave detailed names and graphics so you know where and what every beach is. We went over lure selection, tackle selection, safety on the rocks and most of all how pencil poppers work and to to work them with the rod. As always we show Boating Tip of the Week. Watch a trailer for this episode by clicking the projector icon. Montauk Point Surf Fishing/Part 2 : Our sixth episode of the 2003 season is Part 2 of the trip to Montauk to do what may be favorite way to fish...the surf with Pencil Poppers. My guests for this two part series were Vinny Sobral, owner of Freddie's Bait and Tackle in Montauk and Willie Young, president of the Montauk Surfcasters Association. We used Cotton Cordell pencil poppers in this show for exciting surface explosions as stripers to 20 pounds crushed our offerings on film for all to see. We went over and covered the tidal importance of the Montauk area with Vinny and Willie and included some awesome aerial views of the Montauk Beaches from the south side all the way around the light to Shagwong and gave detailed names and graphics so you know where and what every beach is. We went over lure selection, tackle selection, safety on the rocks and most of all how pencil poppers work and to to work them with the rod. As always we show Tip of the Week. For a Watch a trailer for this episode by clicking the projector icon. Intro To Salty Flyrodding : Our seventh episode of the 2003 season is an Introduction to Saltwater Fly Fishing. In this show it's not about how many fish we catch or how large they may or may not be, but it's an educational experience on how you can get into this great and fastest growing segment of the saltwater fishing industry...saltwater fly fishing...and not nearly as expensive as you may think! In this show, shot in less than desirable conditions this late May, we cover in detail the in's and out's, the should and should-not's of the saltwater fly fishing game. How to choose the right fly line for beginner or expert, how to retrieve your fly line to entice strikes, understanding Fly Fishing's weighted numbering system, choosing the right flies, the right reels and we have an Exclusive Internet only segment on Understanding Leaders for Fly Fishing which did not make the show because of room! We used flies to dupe cocktail blues on the long wand for fun and exciting action. Watch a trailer for this episode by clicking the projector icon. Panfishing with Spinning Tackle : Episode number eight of the 2003 season is a trip I took on my own to the Eldred Preserve to get "the touch" back by panfishing for the giant bluegills and crappie that roam this lake. Located in Sullivan County near Monticello, NY, I had been in a "batting slump" so to speak with the terrible spring weather and not being able to get out and fish both for the show or for my personal pleasure nearly as much as I wanted...or should have been doing by this time normally in June when we filmed. It's always great to get back to basics by chasing panfish like bluegill. They're smart, curious, aggressive and grow large here and what better way to get the touch back then by using light tackle spinning gear with 4-pound test line and light 1/16th and 1/8th ounce lead heads and various plastic 2-inch twister tails and tube jigs. In this show we cover in detail the light tackle advantage and why it's important to get back to basics every once in a while. We go over the lead heads, the line, the jigs and color choices for spinning up some panfish. We also have a surprise for you as this episode is where I set a new, NY State Hybrid striper record...which I unknowingly released back to swim so one of you may catch the monster fish that measured nearly 26 inches...on 4-pound test, maybe one of you will have the next record. We also have an Exclusive Internet only clip on what went on behind the scenes of this record catch of course our Boating Tip of the Week. Watch a trailer for this episode by clicking the projector icon.. To see a video clip of what would have been a new NY State record on Hybrid Striped Bass Click HERE. Fly Fishing for Bluegills : Episode number nine of the 2003 season is a second trip I took to the Eldred Preserve to get my fly fishing chops in order by tossing the "long wand" for giant bluegills, pumpkinseeds and redear sunfish that roam this lake. Using lighter fly tackle than I would trout, I took my trusty 4 & 5-weight fly rods, an assortment of dry flies, nymphs and small popping bugs or water crickets, I explored the edges of the shorelines and weed line and the spawning beds to raise hundreds of giant bluegills. You'll be amazed at the size of these fish when you go to Eldred Preserve. I used a prepackaged leader, but a straight piece of 4, 6, or 8-pound test line would work fine as well when fishing panfish. You will also be amazed at the number of small and of course quality largemouth and smallmouth here that inhale flies and popping bugs. We go over the the line, the flies, color choices for flies and of course our Boating Tip of the Week. Located in Sullivan County near Monticello, NY, Eldred Preserve offers some of the best freshwater fishing in the state! Watch a trailer for this episode by clicking the projector icon. Fluke Fishing Tactics : Our 10th episode for 2003 is a review of several techniques for catching keeper fluke in the bay and ocean though the heat of summer into September. We start with some East End tactics with large bluefish fillets, stripped and jigged hard off the bottom for large fluke. We fished the south side of Montauk using large strip baits. We give you a quick how-to on filleting bluefish, cutting them into strips, the rigging we use and of course some great fishing action. Next we hit the shallow water of the back bays in the heat of July as we show folks some impressive fluke live in the back bays during the hot summer months. Sharpies who work the back bay shallow flats and channel edges are rewarded with for big fluke...some over 10 pounds. My guest is Artie Hoerning and we work the shallow water with 1/2 & 1/4-ounce bucktails and small spearing on very light spinning tackle. We give back trolling techniques on the channel edges and flats, taking "ranges" of where you are so you don't need LORAN or fish finders and by using Mother Nature's signals...keep yourself on the fish for success with keeper fluke. Tackle Segment, a special segment on Bucktail Basics and much more! Next we get into the late summer and early September when BIG fluke want snappers to inhale. I fished live snappers and in two short 4 hour trips in late August, showing folks how we tied our special Daiichi DeathTrap treble hook rig, placing snappers on the hook, drift speed secrets, where to find fluke in the late summer using your LORAN to help control the speed of the drift. One of the the better shows we put together over the years and rolled into this one as well.one I hope you will all enjoy. Watch three trailers for this episode by clicking the projector icons. Brits vs. Yanks Shark Tourney Part 1: Our 11th episode for 2003 is a unique and novel approach we took to the television series. It was something we never did before as we were offered the opportunity to film and produce television coverage of the 1st I Love NY International Brits vs. Yanks Hook & Release Shark Tourney. This is some mouthful and it was a huge undertaking, but worth the risk and the effort. This 3-Day tourney has never been done before anywhere else in the world and was put together by the hard work of the NY State International Tourism Dept., Lighthouse Safaries, Long Island Convention & Visitors Bureau, Lighthouse Safari and Tailor Made Holidays in Great Britain. Watch a trailer for this episode by clicking the projector icon. Brits vs. Yanks Shark Tourney Part 2: Our 12th episode for 2003 is a unique and novel approach we took to the television series. It was something we never did before as we were offered the opportunity to film and produce television coverage of the 1st I Love NY International Brits vs. Yanks Hook & Release Shark Tourney. This is some mouthful and it was a huge undertaking, but worth the risk and the effort. This 3-Day tourney has never been done before anywhere else in the world and was put together by the hard work of the NY State International Tourism Dept. Lighthouse Safaries, Long Island Convention & Visitors Bureau, Lighthouse Safari and Tailor Made Holidays in Great Britain. Watch a trailer for this episode by clicking the projector icon. Legends of Fly Fishing-Part 1 :Our 13th episode for 2003 was a truly wonderful experience for me. I was able to sit streamside with a few legends of the fly fishing game. 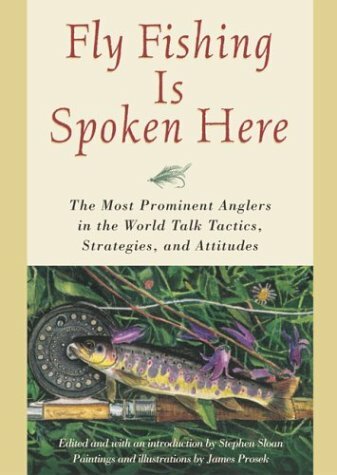 My guest "host' for this show was world record holder, fly fishing author ("Fly Fishing Is Spoken Here") and radio show host Steve Sloan. Steve took us on a tour of the Beaverkill and Willowemac regions of the Catskills region and gave us some in-depth history of the area and the progression of fly fishing in this region. We sat streamside as I interviewed Poul Jorgensen, world noted fly tier, as he showed us the step by step process of tying the March Brown Nymph and we took a tour of the Catskill Fly Fishing Center & Museum with the Exec. Director Paul Dahlie. Watch a tour of the fly fishing museum trailer for this episode by clicking the projector icon. Legends of Fly Fishing-Part 2 :Our 14th episode was part 2 of this Legends show in which world record holder, fly fishing author ("Fly Fishing Is Spoken Here") and radio show host Steve Sloan returned as my guide to this region and again we sat with Poul Jorgensen, world noted fly tier, as he showed us the step by step process of tying the March Brown Dry streamside on the Willowemac. Then I had the true pleasure to sit and interview the first lady of fly fishing, the legendary Ms Joan Salvato-Wulff on the bank of her private property and she showed us some casting details and caught a beauty of a brown trout on camera for us. We reminisced through the years as to how she met her late husband Lee Wulff, what he meant to the fly fishing game and how she has taken over the mantle of the sport in her own right, as she leads women and men through the sport of fly fishing and how she has established one of the greatest fly fishing schools in the country! Again the scenery of the Catskills is as legendary as the people who live there. Watch a snippet of our interview with Joan Wulff by clicking the projector icon. Live Bunker & Striped Bass : We shot the show off Long Beach, Long Island looking for cow bass using live and chunked bunker. As you can see from the photo at left, we succeeded with two bass over 34 pounds, several others over 20 pounds, blues over 10 pounds and a 7-pound weakfish as a bonus. you can see the weakfish catch by clicking on the photo at left if you are using Windows Media Player. On this show we gave you the tackle tips & techniques, rigs and how to rig, how to catch bunker for bait, how to fish chunks or live bunker and ideas on how to prepare the bait. We also gave you a small travelogue of the Jones Inlet area and lots of great catching action in this 30 minute show. This is one video you will want to have in your library.